Watchmen is where it all started; it's the hulking gorilla doppelganger to Art Spiegelman's MAUS. Both graphic novels took the form into places where adult themes and complexity were welcome. 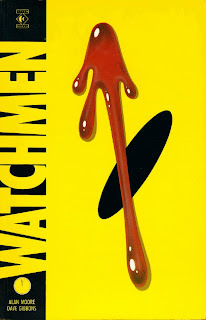 Still, where MAUS was personal and rooted in memoir, Watchmen is a superhero comic in which all of the conventions of the genre have bent, twisted, and spindled to the point of unrecognizability. Nominally, the main story follows the search for a killer of "masked avengers." Someone, somehow has broken into the Comedian's (a sort of anti-hero hero who enjoys death, destruction, and furthering US Department of Defense war aims) apartment and thrown him out the window. As other attempts on costumed heroes continue, Rorshach – a bitterly misanthropic vigilante with an ever shifting mask – attempts to find who is behind the killings and why. The story careens down an ever shifting landscape of betrayal and human weakness. Events of our own time are altered to react to a what-if world of masked, betighted superheroes who fight crime while wearing tights. The US wins the Vietnam War. Richard Nixon escapes Watergate and rewrites the Constitution to re-elect himself several times. Interestingly, only one of the heroes actually has a superpower. Dr. Manhattan has the ability to bend matter to his will after being obliterated by an atomic test and gradually figuring out how to recreate himself into a semblance of his original form. Unfortunately for Dr. Manhattan, with great power has come overwhelming ennui and disinterest in humanity. Alan Moore is a clever, complex writer who delights in paranoia and a sense of impending collapse. He mixes perspective, time, genre, and theme nimbly and finds ever more ingenious ways to combine storylines. Sections of the main story are layered with selections from memoir excerpts, magazine articles, pirate comics, academic journals, police reports, and magazine interview profiles. The sense that the magazine occupies an entire alternate universe is painstakingly constructed throughout. However, just as in HUCK FINN, students might have a hard time recognizing that the thoughts of the characters don't necessarily represent the ideas of the writer. For instance, Rorschach has the bulk of the voiceovers and he is constantly obsessing over the moral decay of society--to the point that he comes off as racist, sexist, and any other ist you might think of. There is even a copy of the right wing periodical The New Frontiersman, which gives a taste of the xenophobic ramblings he obsesses over ("I've had it up to hear with those coked-out commie cowards..."). Teachers would need to directly remind students that the opinions of the characters might not be opinions the writer is advocating. Still, this technique neatly subverts traditional comic conventions as none of the heroes occupy the moral high ground, but neither do they lack at least some measure of sympathy. The art has a classic comic book style with 3-panel formats predominating. Gibbons mixes perspectives and angles well in telling the story, but there isn't the innovative, impressionistic style that came later in graphic novels such as THE KILLING JOKE or THE DARK KNIGHT. For students, the style's clarity and simplicity helps tell the story and create a sense of paranoia without adding extra difficulties in comprehension. This is clearly a book for high schoolers and perhaps upperclassmen as well. Undoubtedly, Watchmen is a classic of the form and excellent in its sophisticated exploration of power, authority, history, and the human condition. However, it's also filled with graphic violence, sexual themes, controversial politics, homosexuality, and unreliable narrators. A teacher would need to be careful to explain the use of irony and to allow students to question Moore's perspective on American history and politics. Parents should probably be asked to sign off on using it in a classroom setting. WATCHMEN is great. I just ordered it for my library and I am anxious to see what my highschoolers think of it (who have until now been fed loads of NARUTO and the Cartoon Network mangas). Excited for the movie. M.S. Mail Order Ninja is a favorite elementary American manga of mine. Rod Espinosa is great. I did a review of Courageous Princess and Neotopia on TGC. Check them out. Not read Watchmen yet, but I know I need to. Like The Dark Knight Returns, any real comic fan needs to read Watchmen. Thank you so much for acknowledging graphic novels as a valid form of literature. I use several graphic novels in my classroom ( I teach history). My students are currently reading The Watchmen, and it is working out wonderfully. And for anyone who is concerned about what level to use this novel with, I am currently using it with both special education students and gifted students, 11th and 12th grade. And it works so well with all of my students, I am amazed. When will other teachers wake up and realize that graphic novels are such an amazing and unused resource for students!? I'm starting Watchmen today with my British Literature class and I know that at least two of my 6 students were spellbound. I look forward to getting down to the juicy morsels with them! We're going to see the film in 3 weeks.